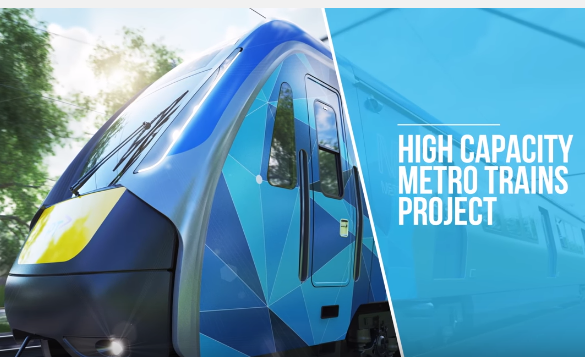 Minister for Public Transport Jacinta Allan announced on Tuesday that a consortium led by Downer Edi has been selected to deliver the Victorian Government’s $2 billion High Capacity Metro Trains (HCMT) project. The Evolution Rail consortium – which comprises Downer, CRRC Changchun Railway Vehicles and Plenary Group – has been contacted to design, manufacture and commission 65 HCMTs for use on the Cranbourne, Pakenham and Sunbury lines in Melbourne, as well as to build two training simulators, a train maintenance facility and stabling yards at Pakenham East. Under the $1.4 billion agreement, the consortium will also design, construct and commission a light service facility at Calder Park and provide maintenance of the rolling stock fleet for 30 years. In announcing the contract award, Ms Allan stressed that the HCMT trains will incorporate over 60% local content, exceeding the Labor Government’s commitment to 50% local content. “We’re investing in new trains built in Victoria, for Victoria – putting local jobs and local train users first,” the Minister said. She said the new trains will reduce crowding on Victoria’s busiest rail corridor – the Cranbourne Pakenham line – before running as a dedicated fleet from Pakenham to Sunbury through the new Metro Tunnel. “Together with the removal of every level crossing between Dandenong and the city, these new trains will reduce crowding and make the daily commute more comfortable for thousands of passengers,” Ms Allan added. Minister for Industry and Employment Wade Noonan said the project will generate 1,100 highly-skilled local jobs, adding that 15% of work on the project will be carried out by apprentices, trainees and engineering cadets. “These new trains will create 1,100 highly-skilled jobs and provide experience and opportunities to young workers, and people re-skilling from other sectors, including the auto-industry,” Mr Noonan said. The first HCMT will be delivered by November 2018, with all 65 trains to be ready for the opening of the Metro Tunnel in 2026.